Fall is one of the most exciting times of the year for both parents and children. It is the season of Back-to-School, with all the excitement and anxieties that come with it. This can also be true for children, and parents of children undergoing orthodontic treatment. For parents, the end of summer and beginning of the school year is a time of excitement as they anticipate hearing about their child’s new classes, teachers and friends, not to mention the many activities in which their children will be involved. However, it is also a time for having less control and supervision over their child’s orthodontic hygiene and care, and this can be a source of anxiety. As for kids, many will feel the excitement of a new year at school, of reuniting with friends after a long summer, of seeing their favorite teachers and maybe even showing off their latest accessory…their braces. One way to put both parents and children at ease when it comes to orthodontics at school is to discuss a “Plan of Action”. If you and your child understand the plan ahead of time, it will help ensure a successful (orthodontic!) school year! Bring a toothbrush to school – It’s always best to brush your teeth after you eat lunch. A quick brushing doesn’t take long and will help keep your teeth and braces free of food, which helps to avoid cavities and/or permanent staining on your teeth, as well as bad breath! Drink Water – Bring a BPA-Free water bottle to school and drink throughout the day. This helps to keep your mouth clean by rinsing away large food particles stuck in your braces after eating, and by neutralizing acids in your mouth from the food you ate which will help prevent staining and demineralization of your teeth. If it’s difficult to take a toothbrush to school OR to find time to brush at school, rinsing your mouth after eating will help until you are able to brush properly. A great idea is to use a disposable toothbrush, like the ones we have in our office, as your school toothbrush. Keep it in your locker in a toothbrush case along with some toothpaste, and you will never have to remember to bring it to school. Packing your lunch and snacks – When packing lunches and snacks, avoid foods that are hard, sticky, chewy or crunchy to prevent bending wires or breaking braces. If you like hard fruits and vegetables, such as apples and carrots, cut them into smaller pieces before you leave for school. Biting into hard fruits and veggies can damage your braces, which can cause discomfort and could lengthen your time in braces. Emergencies – If a bracket breaks off during school and you are not in any pain or discomfort, you don’t need to get out of school to have it fixed. Just call your orthodontist to let them know, and they will advise you of the best way to handle it. If you are uncomfortable, they’ll be happy to accommodate you to make you comfortable until a repair appointment can be scheduled. Make sure you have WAX with you in case of a poking wire or irritation. Rubber bands – Don’t forget to change your rubber bands and bring a supply with you to keep in your desk, backpack or locker. If it’s difficult to remember to replace your rubber bands after eating, go ahead and wear them while you eat! Doing so could make your braces come off sooner than planned! A great idea is to have an orthodontic baggie in your locker that has everything you need to take care of your orthodontic appliances, and to make sure your mouth stays clean and comfortable while you’re at school. Do you play a Sport? – Protecting your braces during sports not only protects your teeth from accidents but also protects your braces — a large investment for any family. 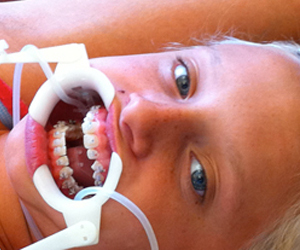 Contact your orthodontist to inquire about the sportsguard options they have available! Do you play a Musical instrument? – At our office we have lip protectors for our Musicians in braces who play an instrument with a mouthpiece. This is a plastic guard that slips over the wires and brackets to protect your lips from cuts or discomfort. Contact your orthodontist to inquire about lip protectors. Lastly, Don’t forget to SMILE! – Show off your beautiful smile to your friends and family and tell them that they too can start their journey to a beautiful and healthy smile by visiting us for a complimentary initial examination. Once you have your agreed upon “Back-to-School Action Plan,” your orthodontic anxieties will fade away and you’ll be able to once again focus on all the excitement that fall and being back at school bring!